A Doctor Seuss garden, a swampy garden, a veggie and herb garden, a rain garden, a water garden including a pond with a rocky stream — that’s just the beginning of a peek at the garden retreat and plant treasure trove of Tracyton gardener Ron Gillespie. 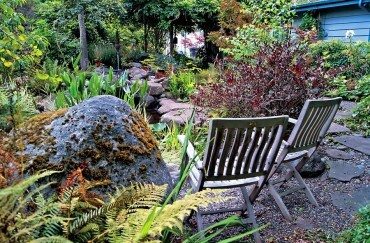 This gardener’s paradise sits on several acres off Tracyton Boulevard and includes fences, arbors, raised beds and meandering paths made out of many different materials, and even sports a workshop with a garage to house all the accoutrements of caring for this bit of heaven in West Sound. 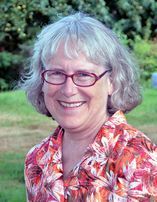 Gillespie, now retired, taught one year of elementary music and 22 years of history; he then was in administration for seven years, finishing up his career on the East Coast. But his ever-sustaining hobbies have been gardening, art and traveling. His parents and grandparents were gardeners and his Tracyton garden still has treasures from their gardens tucked here and there. 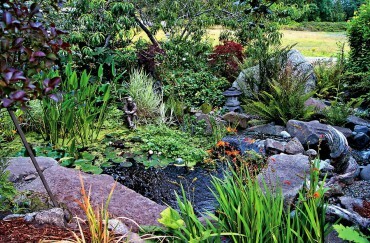 He’s brought all these skills and love of beautiful and interesting things into the creation and maintenance of his garden. The first garden room began with a tall, stately Norwegian red oak tree planted four decades ago. Gillespie has continued to work on and expand various rooms throughout the property. He adjusted the plants and soils to suit the various planting zones he encountered. Some areas include raised beds and others work with the natural depressions. One area even includes a swampy bog where road runoff accumulates. It’s now resplendent with willows and other water hogs. 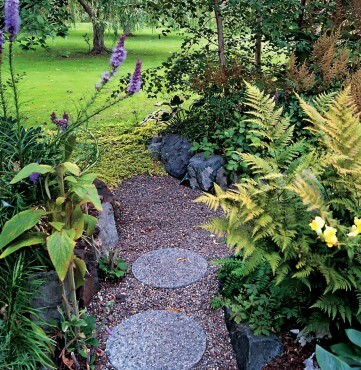 Paths are varied throughout and include these materials: pea gravel, large paving stones, bark, stepping stones and crushed granite. 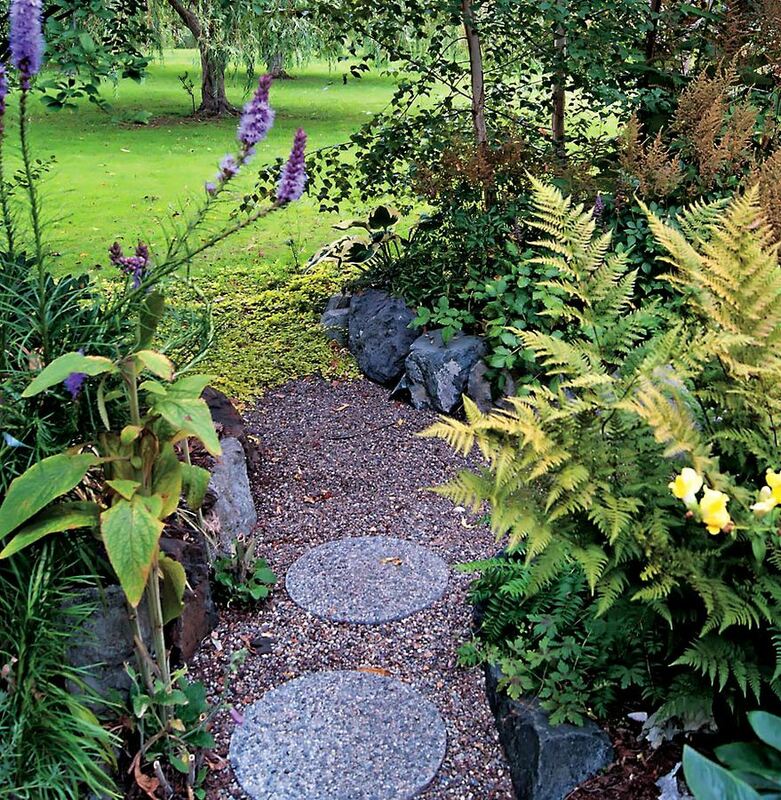 Raised beds made of rock, cottage stones and reclaimed chunks of concrete provide opportunities for more garden rooms. To create new beds, Gillespie first covers the spot with cardboard and then begins piling up compost, garden soil and other amenities leading to the final product. Fencing, trellises and arbors abound, giving definition to each garden room. Living walls lend a hand, too. 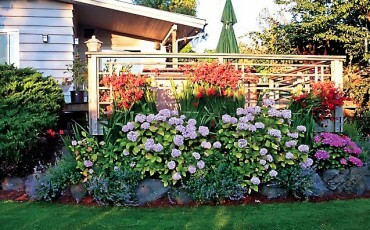 One section of property line is interlaced with shrubs, fronted by tall sweeps of dahlias, drinking in the sunlight. “My mother loved dahlias. I always dig up and store the tubers each year. I lost several by leaving them in the ground so I don’t do that anymore,” Gillespie says. He does not map his garden rooms and beds but does label and keep track of dahlias and lilies. 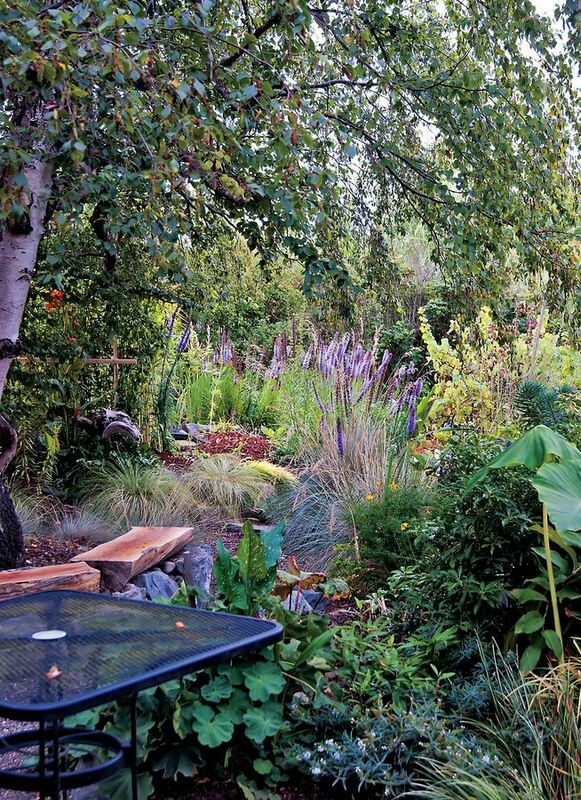 The various gardening areas grow organically and always look appealing and enticing. Gillespie is not averse to moving plants around either when they need a better location. When a plant dies, he is happy that it gives him somewhere to tuck in a newly acquired plant. However, plants rarely seem to die in his garden. He’s fortunate that he has many zones (sun, shade, damp, dry) to choose from. 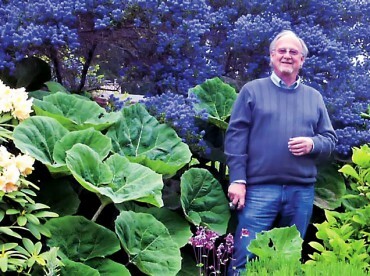 Gillespie estimates he spends three to four hours a day on average throughout the year working in the garden. This includes harvesting fruit, veggies and herbs, along with preparing and storing them. It also includes the five hours it takes to mow his lawn (which is really more like a humongous pasture). “It’s really just a little bit here and a little bit there,” Gillespie says. He “buttons it all up and mulches” in September and October and then retreats inside in November for the monsoon and winter season. He picks projects each year. 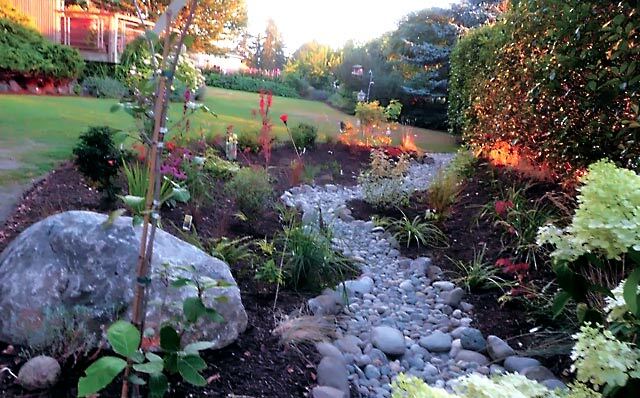 In 2012 he installed a rain garden with assistance from the Kitsap County Surface and Storm Water Management rain garden grant administered by the Kitsap Conservation District. 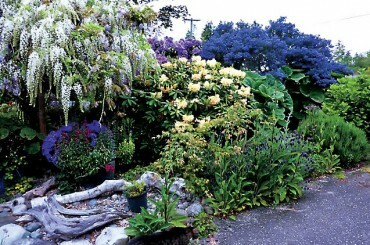 He also removed buddleia bordering his garage/workshop and replaced them with lilacs and daisies. 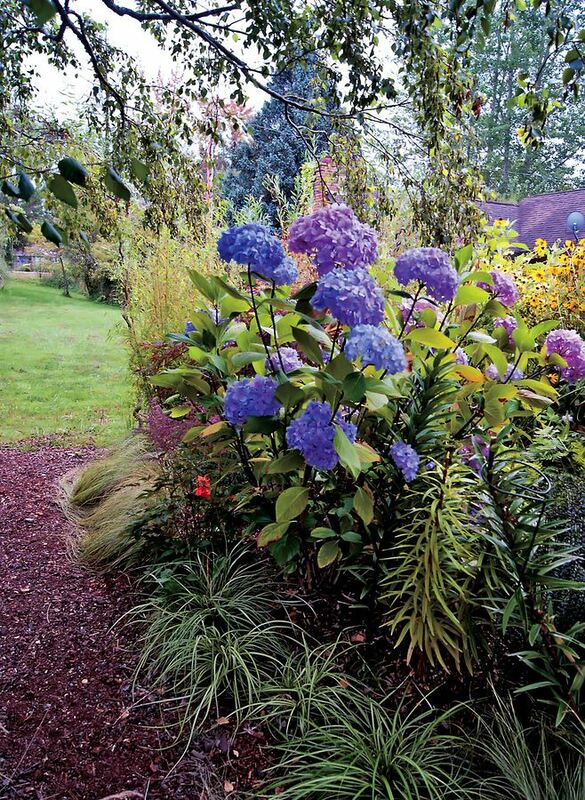 “I knew buddleia was a noxious weed and so I removed them all,” he says. The two weedy plants Gillespie says he’d love to get rid of entirely are horsetail and morning glory. “I’ve been collecting plants for years,” he says. A favorite place to collect was Dan Hinkley’s Heronswood in Kingston. Gillespie also travels throughout Puget Sound seeking out plants he doesn’t yet have in his garden. 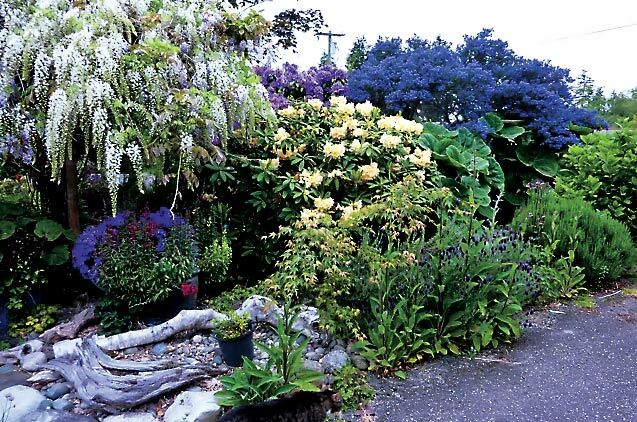 He patronizes local nurseries and loves local plant sales, he can hardly wait until the Bloedel Reserve has its third annual plant sale this spring. Sometimes a new garden bed will arise from stray seedlings found here and there on the paths. The garden rooms are densely planted and some cannot hold any of these escaped seedlings so Gillespie creates a new home for them, by building another bed. He also generously shares his abundant extra plants with others. This part of the garden includes plants with interesting textures, shapes and smells. 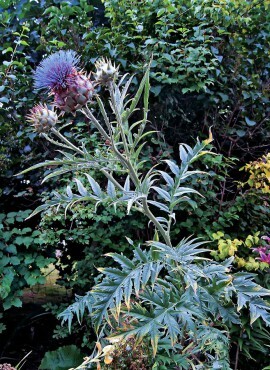 It includes Melianthus major (honey bush) and Voodoo lily (Dracunculus vulgaris, sometimes called dragon flower). 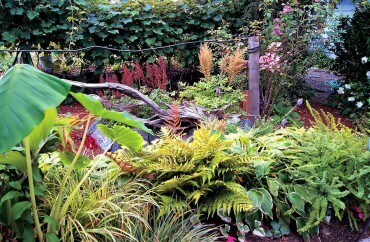 There’s a dip in the garden where moisture collects, making it the perfect spot for giant Gunnera (aka dinosaur plant). 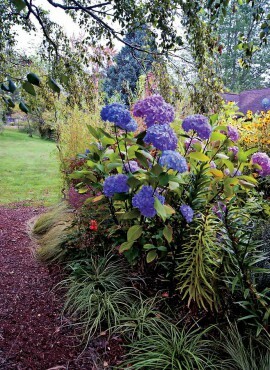 Colorful blooms, leaves and twisty or peeling bark are featured here. It’s a riot of color in late fall. Tall figs hang over an arched area, creating a natural arbor. Mock orange with all white blooms leads the eye in to explore. “I wanted it to look like Doctor Seuss,” Gillespie says. Figs and Asian pears, along with berries, herbs and abundant vegetables can be found in numerous raised beds throughout the property. Gillespie mingles these food plants right in and among the ornamental plants. One bed is edged across the back with red Crocosmia behind pink hydrangeas, with blue flowered Nepata (catmint) in the front. 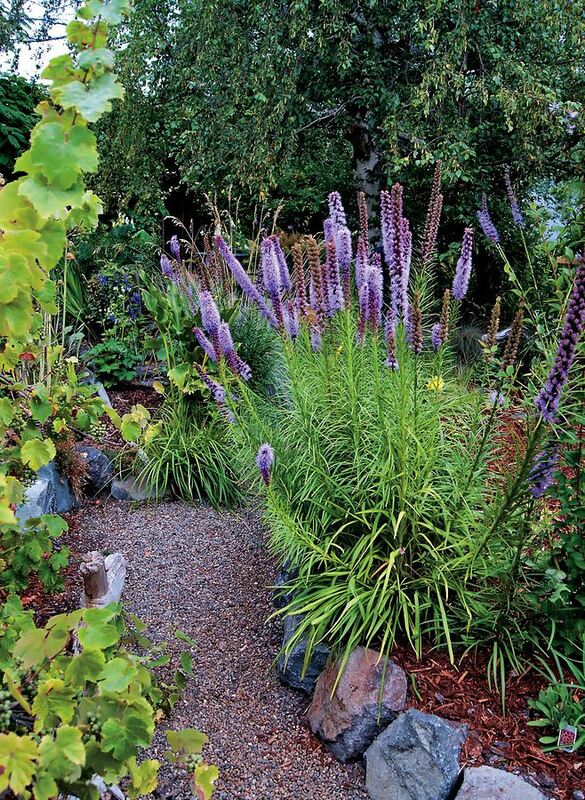 All of these plants attract pollinators such as butterflies, bees and hummingbirds. 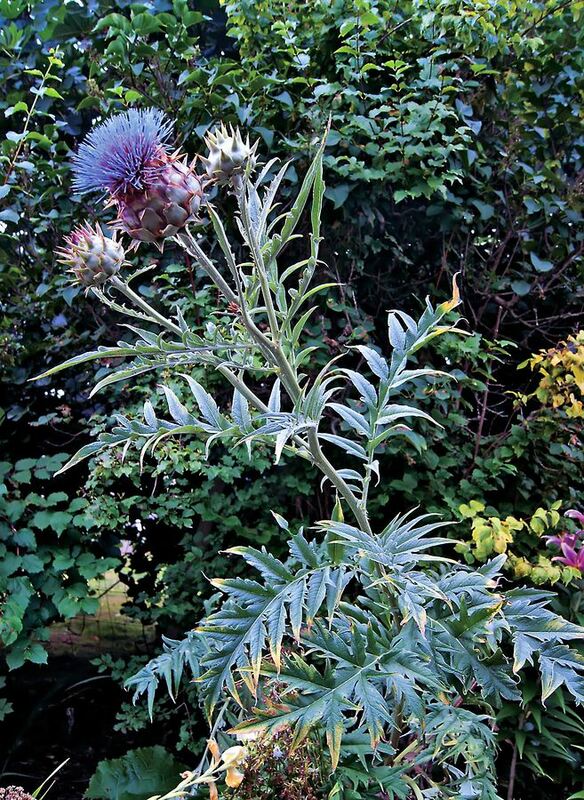 Gillespie repeats the combinations of using colorful pollinator-attracting plants throughout his gardens. Gillespie harvests and dries the herbs each year. He saves the empty 2.5-pound Kirkland brand nut containers from Costco, then fills them with dried herbs and labels the lid. “I built a special shelf for stacking them,” he says. Outside Gillespie’s front entrance is a shade-dappled pond. The path is festooned with shade-loving plants. Years ago, runoff from rainy weather congregated in this area so he built a pond and a dry streambed for overflow. Sometimes the water would continue through the dry streambed and pool for a while on the lawn. The area actually drained well most of the time but it appeared to be a good spot for a rain garden. 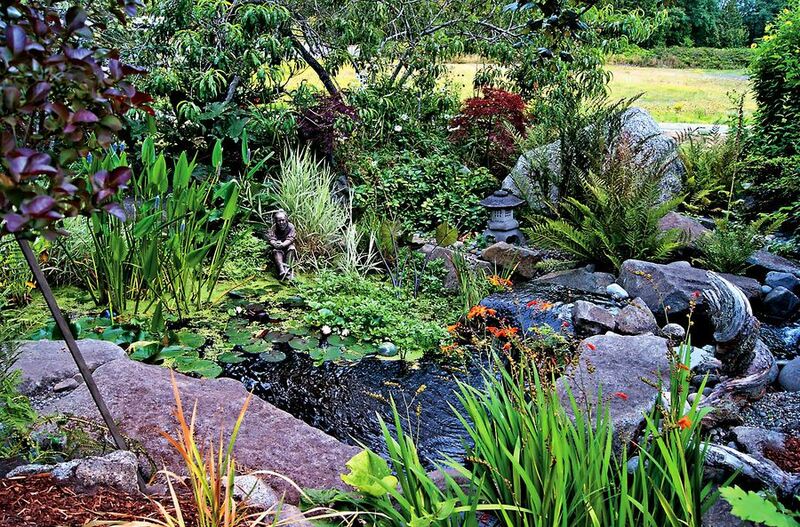 The pond and dry streambed remained but were utilized to channel roof and downspout runoff from the house into the rain garden to filter out toxins and, happily for Gillespie, gave him another place to plant even more treasures. 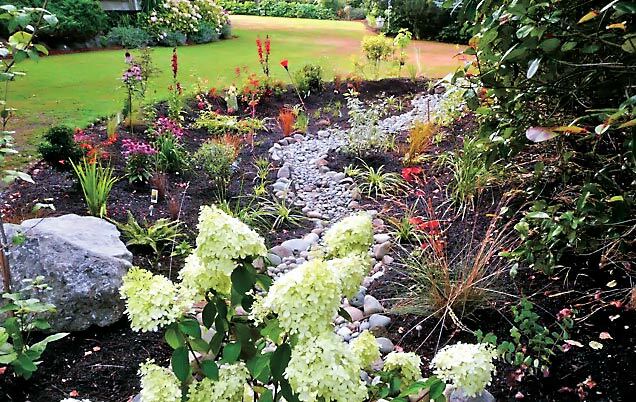 He combined the best of both worlds — shade for the pond and full sun for the rain garden, along with a decorative system to channel, filter and clean stormwater runoff. This area has 88 varieties of dahlias. The dahlia bed is where pumpkins (or other squash) are grown each year. In front are nasturtiums. It’s a riot of orange, red, peach, yellow, gold and every sunny shade imaginable, with varying degrees of green foliage provided by the plants. The deck surrounding about a third of the home is full of potted plants. A railing running around the deck has planter boxes where geraniums and begonias reside during the spring and summer months. “I pot up bulbs each year and then after a season plant them out in the garden. Some come back and some don’t,” Gillespie says. He also saves the begonia corms and replants them each year. 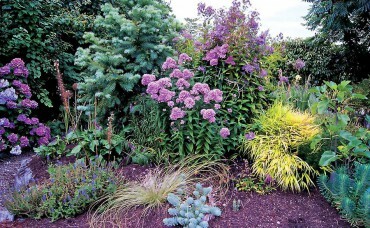 The deck is bordered by beds containing shrubs, herbs and bulbs that ebb and flow with the seasons. A greenhouse/sunroom runs along one portion of the home. Gillespie uses this area for starting seeds, displaying favorite houseplants and for shelter for his tropical banana plants that he just couldn’t resist planting in the center of several of his veggie and fruit beds. He keeps the banana plants in pots, even though they’re hardy. “The only thing I bring in besides all the potted plants are the begonias and dahlias and, of course, the bananas,” he says. 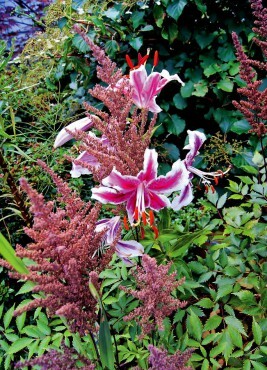 “I can remember the first letter of the varieties I plant and then I give it my own name. 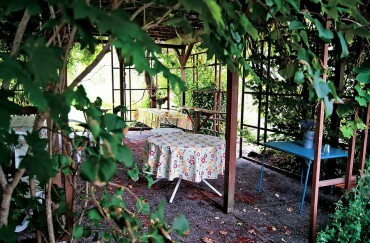 The grape still covering the arbor is called Neanderthal because it wanders everywhere,” he says. Also hidden in this shady bower are a hammock and a wooden counter, just right for cocktails or a buffet. Gillespie has been known to share this space once a year when his dear friend Joyce Merkel and the ladies from the Seabeck Garden Club come to explore his garden and enjoy his gourmet cooking. “We set up tables and chairs and put the hammock away. It gives us a shady retreat to sit and visit,” Merkel says. What a fitting respite for an arduous gardener at the end of a day of creating, working and living in paradise.